Head Vases - aah. I've found and kept many over the years (and yes I have let some find new homes too). The Girl in a Yellow Sunbonnet, remains one of my favorites. 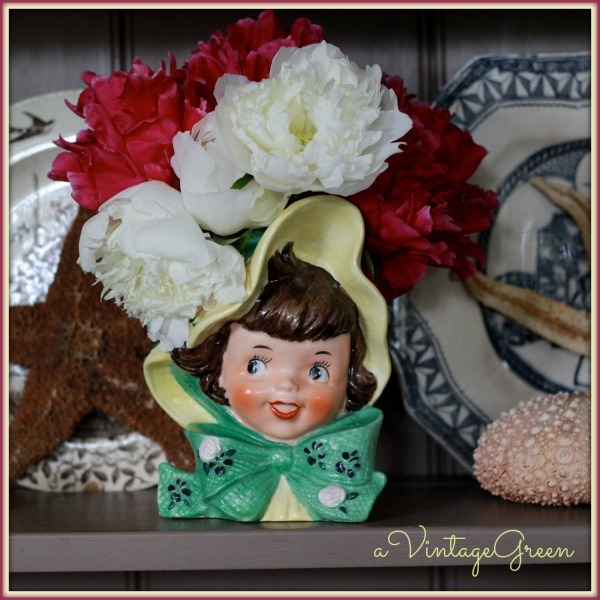 She has worn peonies over many summers as well as dahlias, both make wonderful bonnets. Saturday a 1964 Relpo head vase was found. This Lady loved pink carnations for her bonnet. If you want a bit more information about head vases I have written about them in the past. On February 19, 2011 I wrote a post about head vases with a bit of history included and on November 30, 2010 a post about a Rubens Lady Head vase. Joy - Your new head vase is just beautiful - so refined and dignified. Wonderful find. 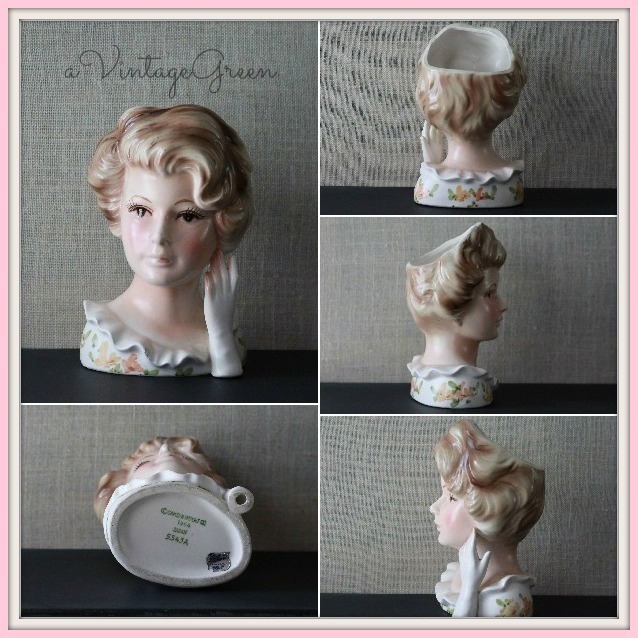 You have a wonderful collection of head vases! Congrats on your new find! Wishing you a happy week ahead! I recently found one at the thrift store and I sure do love her. There's something so feminine about have one on your dresser! I love your beautiful vases! The yellow sunbonnet is very sweet! The new head vase is very elegant looking. I remember my mother having a couple on the window sill growing up and wish I had them now. What sweet vases, Joy! I know you have fun with them!! Thanks so much for popping by my blog today. I am so glad to be starting to blog regularly again!! Hope you have a delightful week! Hi Joy ... I too, love the one with the yellow bonnet. Your flower arrangements in them, make them look like a real hat. So pretty! I just love how elegant they are! I love the smell of peonies. We moved ours this spring and they rebelled by not blooming this year :( Maybe next year. 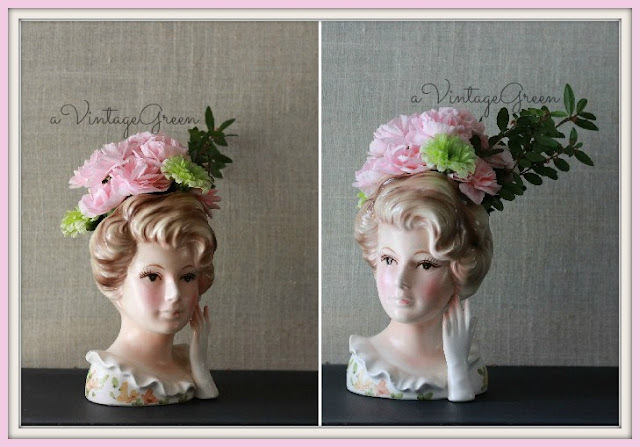 I adore head vases and have quite a few! I love head vases-- have a small collection myself. Yours are great! What a nice assortment of head vases. I have seen some before but not these. Very nice. I was out and about a few weeks ago and saw a huge collection of these. Some so cute, a few were laughable creepy. Yours look just right with the flowers in them. Maybe I should reserve judgment until I've seen all of them with flowers in their hair/head/hat. Oh, yes! Your sunshine hat lady is a dear! But, I do love your elegant miss with the pink carnations - more my style. I have a Rubens lady in blue with pearl earrings which I acquired at an auction. I also have a knock off model with more wear and tear - including a crack. I still like her, though - for the vintage appeal. Lovely to see so many commonplaces we share - will want to visit again for your inspiration and tutorials! Joy, I had never heard of head vases until a couple of years ago. They really are a great collectible and can be quite pricey. Love the flowers you choose for their bonnets! thanks for sharing with SYC. Those are so cute Joy! I have never heard of head vases! Thanks for sharing! I just love head vases. They are so quirky and fun!